This training circular provides GEOINT guidance for commanders, staffs, trainers, engineers, and military intelligence personnel at all echelons. It forms the foundation for GEOINT doctrine development. It also serves as a reference for personnel who are developing doctrine; tactics, techniques, and procedures; materiel and force structure; and institutional and unit training for intelligence operations. This Homeland Security (HLS) Geospatial Concept of Operations (GeoCONOPS) has been developed as a strategic starting point for understanding how the coordination of Homeland Security and Homeland Defense (HD) geospatial activities can be improved at the federal level. The intended audience for this document is the full geospatial community supporting the missions of the federal government under the National Response Framework (NRF) and Presidential Policy Directive 8 (PPD-8). This includes the stakeholders and actors representing the Emergency Support Functions (ESFs), the Joint Field Offices (JFO), Federal Operations Centers, the disaster preparedness exercise and evaluation community, and those involved in other NRF missions. Individuals representing these groups and activities have been extensively engaged in providing input for this document. 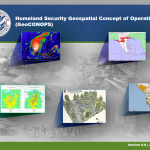 The Homeland Security Geospatial Concept of Operations (GeoCONOPS) provides an understanding of the current landscape for the coordination of disaster response geospatial activities at the Federal level. The document serves the geospatial communities that support emergency management activities of the Federal government under Presidential Policy Directive 8 (PPD-8). This includes individual Emergency Support Functions (ESFs), the Joint Field Offices, FEMA Regional Coordination Centers (RRCC), and the National Response Coordination Center (NRCC). Stakeholders and actors representing the federal geospatial community have been extensively engaged in providing input for the development of the GeoCONOPS document. 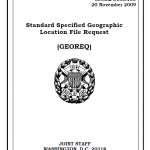 The GeoCONOPS serves as a guide to the Federal departments and agencies providing geospatial support under the Stafford Act which defines the programs and processes by which the Federal Government provides disaster and emergency assistance to state and local governments, tribal nations, eligible private nonprofit organizations, and individuals affected by a declared major disaster or emergency. 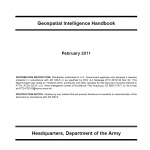 A user guide for the National Guard’s Geospatial Information Interoperability Exploitation Portable (GIIEP) system from March 2010.